In the background we see a “blue era” Union water tower prominently displayed with clear “Union” markings and the “dual halo” neck pieces. 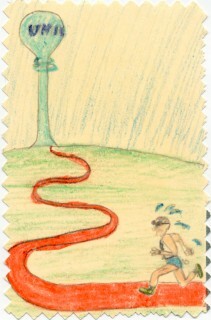 In the foreground, a runner follows an arduous path to the summit. The runner is dressed for summer, glasses and shorts, sweating and struggling to reach the top. A deckled edge surrounds the scene. The bright orange path, though clearly depicted and unhindered by obstacles, winds its way up a tall hill to the World’s Tallest Water Sphere. There are many interpretations, but this is clearly a piece about striving to perfection. The WTWS is at the summit and the object of the struggle. The author reveres the World’s Tallest Water Sphere by placing it on the holy upper left of the piece, venerating the clean fresh drinking water and steady pressure provided by the tower. The hill is centrally depicted, and echoed in the mountainous deckled edge, but the path is long and ascending. The sylvan hill is in contrast to the actual setting of the WTWS. The runner is well prepared, but there is a long way to go. The skies are blue, but the runner has come a long way. Will he succeed? Or will there be a dehydrated body left at the foot of the mighty tower? This entry was posted on Monday, May 11th, 2009 at 7:06 pm	and is filed under Art. You can follow any responses to this entry through the RSS 2.0 feed. Both comments and pings are currently closed.